Looking for resources for hotels who are already on the Google Hotel Finder platform or how to get your property listed? Get your questions answered by Google Here. In July of 2011 Google launched Hotel Finder, a tool positioned to assist travelers in finding a hotel that fits their search criteria, thus making the travel planning process fast & easy. Google purchased ITA Software in June of 2010 for 700M giving them access to the software behind popular meta search sites like Kayak, Hotwire, Farecast and a number of others since 2006. The power of ITA Software combined with Google’s vast travel knowledge based on what travelers have been searching, made others instantly consider Google as a powerhouse within the travel industry. OTA’s and Airlines banded together to fight Google because they knew this is the place where more than 75% of the traveling public starts the travel planning and booking process. Long story short, the FTC gave Google the ok to finalize purchase of ITA, but said they could not own the entire booking process. In other words, Google could present the data, but must pass the links and potential bookings onto the suppliers (which at the time, were only large OTA sites). With the addition of real-time pricing and inventory this new software provided, plus the local hotel information already in their database, Google put together a basic website leveraging their current products and information from Google Maps, Google local business/place page listings, reviews, hotel images and more. Google then created links directly to the supplier site who provided them with rates and availability and Google Hotel Price Ads was born. 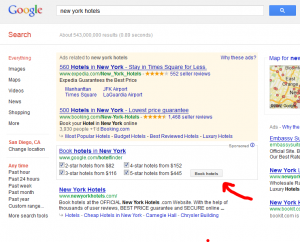 Important to note, Google Hotel Price Ads is completely separate from Google’s AdWords program, so if you are currently participating in Google AdWords, you are not also participating in this Google Hotel Price Ads program. 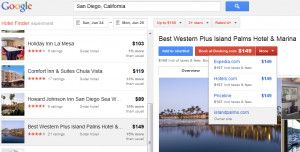 The Google Hotel Price Ads program is specific to a hotel’s name and the rates and inventory for that particular hotel. Rates and inventory are pushed to Google’s system for the next 90-days and are based on the lowest rate for 2 people in a room. OTA’s bid through Google’s tool for a particular hotel’s name and the top 5 bidders combined with quality score (a Google metric) and the lowest price, will determine which OTA’s show up in the drop-down box. Google has recently launched an additional bidding tier called Promoted Hotels which allows for up to 2 hotels to be bid on and the bidder gets an exclusive link to only their site locking out all other sites from being shown. Below is a search with one Promoted Hotel, notice there are no other OTA links – this is what we’d call bidding for exclusivity. The best news, and why we’re here…is to tell you that Google has recently allowed selected technology providers, Woodcrick included, to allow hotels to provide real-time rates and inventory to Google in order for participating hotels to compete on equal footing with the OTA’s who are bidding for their hotel’s name. We often get asked this question…and the answer is: Google Hotel Finder is not going away. Yes, it’s currently being called an “experiment” but only because Google wants to continue to update the user interface (the look and capabilities of the front end). Google won’t remove the word “experiment” until they are satisfied that this is the version that they can start marketing to the masses. Google’s already started marketing this helpful tool within regular searches when it detects a hotel search within a major metropolitan or tourist area named (i.e. New York Hotels). Google is currently in the process of testing a more robust mapping tool which includes popular neighborhood areas “Areas to Stay” and “Places to Stay Near” which include tourist, points of interest and attractions all within Hotel Finder. We’d expect Google to launch this new enhancement in the near future throughout all major tourist markets as an additional helpful tool for travelers. Let us know if you have questions regarding Hotel Finder that we can answer for you, or items of interest you’d like to have us keep you informed of on this blog. Contact a Woodcrick Representative for a live Demo or an analysis specifically tailored for your particular hotel or group of hotels showing you how much you can save in net profits by driving customers to book direct.